Jeremy Parr is a senior corporate partner and global head of the consumer and retail sector at Allen & Overy, a global law firm with 44 offices in 34 countries. Jeremy has worked on London-based international transactions for 30 years, advising stock exchange listed and private companies, financial investors, individuals and governments. His experience includes private equity, privatisations, joint ventures, complex commercial agreements and public takeover bids. He regularly advises boards of directors of limited companies and stock exchange listed plc’s on their legal and regulatory obligations and has wide experience of advising on corporate governance and risk management issues. 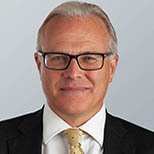 He is the Chairman of the Board of Trustees of Allen & Overy’s staff pension schemes in the UK and was previously a member of Allen & Overy’s audit committee.